It’s been a while since I visited a film night. Nice to get out every once in a while. It’s all Clive’s fault, of course. It usually is. He was asked by the lovely Mark Brown of BraineHownd Films if he had any content for their new film night in South London. His latest venture, Acceptance, is still in post-production (although I hope to have good news on that soonly) so he decided to dig something out of the archive–our 2009 Straight8 film, Code Grey. Forest Hill is a pleasant, leafy South London suburb, surprisingly easy to get to from the centre of town: a 15 minute, four-stop train ride. So much for Saarf Lunnun being hard to get around. The Hob, the venue for the evening’s shenanigans, is even more usefully situated– across the road from the train station. Although you do need to know which exit to use, as I discovered to my cost. 20 minutes of wandering around on the wrong side of the tracks is, apparently, something of a rite of passage for first-timers to The Hob. I was greeted, once I finally found my way through the doors of The Hob, by a large, friendly room and Clive with a very welcome pint. 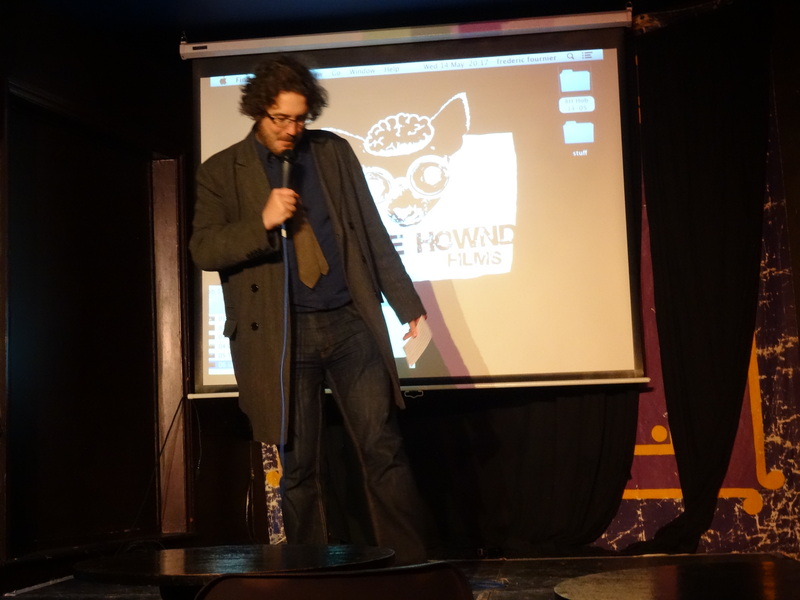 The Hob is a hub (see what I did there) for stand-up comedy, with a stage downstairs and a full room upstairs. This makes it much more easily set up as a venue for films: for one thing, there’s a proper screen. The Hideaway Bar in Crouch End, BraineHownd’s former home, had a decent sized room but a sheet for a screen. No need for that. Mike Shepherd, rocking the mic right. Comedian and History’s Greatest Monster Mike Shepherd expertly guided us through the evening. There was a cornucopia of goodies. Sam Toller and Josh Barnett’s Get Your Slice is both satire and promo on the small arts festival scene, and made one point very clear–if you’re going to start a festival, there has to be cake. Phil Haine and Jonathan Brown’s I Am Lonely is a clever slice of zomb-com which gives new proof to Sartre’s assertation that hell is other people. Touched by Jeremiah Quinn is a mood piece on grieving and letting go: beautifully shot if a little dour. There was a promo for in-production feature Cattle Raid, a futuristic take on an old Irish myth, and Fluffy: A Love Story, a clever and screamingly funny short on the way we can sublimate our feelings into the smallest and most inconsequential of objects. Oh yes, and there was Code Grey. I’m glad to report that it still works, and trust me, there’s no buzz like writing a comedy and getting laughs out of an audience in the places you planned. With a surprise appearance from other cast member Andrew Lawden, we rocked the Q&A. With that lot, a presentation from arts crowdfunding startup Phundee, and a chance to chat to some old friends (Hi, Lou!) the BraineHownd night was packed full of film-makey goodness. I was sorry to have to slope off to catch my last train, but the effort in getting out to South London was well worth it. On the opening night of the Cannes Film Festival, Forest Hill was the place to be. I left re-energised, and the long trip back home gave me enough time to blast out a script for a new collaboration that the Leading Man and I are working on. More news on that through the next few months. Thanks again to the guys at Brainehownd for letting us show Code Grey. They run regular evenings both at The Hob and Crouch End’s Art House Cinema. For more info, check out the Facebookery. Previous Previous post: Excuses And Half Truths Presents: Rob & Clive’s Speakeasy!